In May of 2016, Raymond entered the Resident Home Association’s (RHA) Garber Road location as a permanent resident. 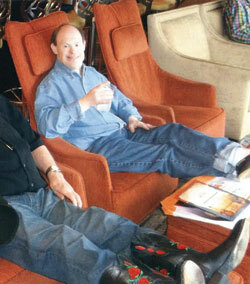 Raymond’s brother and legal guardian, Dave, discussed with the group home staff about Raymond’s love of country music. Garber House Manager Kris Bergman mentioned that she had taken a number of the group home’s residents on a country cruise the year earlier, and another trip was planned for around the end of January of 2017. Years earlier, Raymond had been on a few other cruises with family members to places like Hawaii and the Caribbean, and the mere mention of going on a country music-themed trip really excited him. Kris immediately got things rolling, and it was determined that she would be the chaperone taking Raymond, along with two other group home housemates, Leroy and Bill. The cruise was part of the Montgomery County Developmental Disabilities list of activities developed for use by caregivers to enrich and enhance the lives of the disabled throughout the county. Fortunately, Raymond has sufficient funds deposited in an account with The Disability Foundation, part of The Dayton Foundation to allow for such expenses. His account was able to fully fund the trip and allow for some additional expenses for things like souvenirs, land side trips, and even a massage. 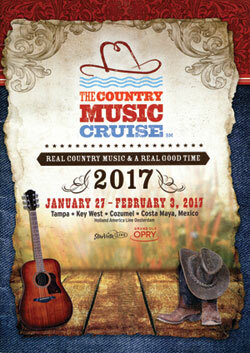 On January 27 through February 3, the 2017 Country Music Cruise set sail from Tampa, Florida. The cruise was aboard a Holland America cruise ship in conjunction with the Grand Ole Opry, and included stopping at ports in Key West, Cozumel, and Costa Maya, Mexico. Nearly 20 country western stars were on board, and performed throughout the ship. The performers included Charley Pride, The Oak Ridge Boys, Brenda Lee, Lee Greenwood, Tanya Tucker, and many others. For Raymond, this cruise was nothing short of heaven. He had his picture taken with many of them; they were all happy to oblige one of their biggest fans. enjoyed interacting with the three guys. 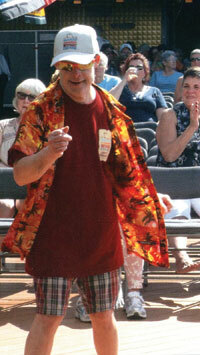 Knowing Raymond’s love of dancing, he was entered into a dance contest. Two other women also entered the contest, and without any hesitation, Raymond jumped on stage and demonstrated his “moves.” The crowd loved it, and he took First Place. He was awarded a t-shirt just like the one that he had already purchased earlier on the cruise. The staff decided to take him to the gift shop and exchange it for a large canvas tote bag with the The Country Music Cruise logo. Raymond carried that tote bag around the ship, and eventually got almost every performer on the cruise autograph it. It now hangs on the wall in his room at the group home covered on both sides with autographs. It’s one of his prized possessions. Raymond is already signed up for the next country music cruise scheduled for early 2018. Like the 2017 cruise, the next one has already been paid for with funds from his Disability Trust Fund.